Despite having no actual physical presence there, OneCoin up until recently claimed to be a Gibraltar corporation. This was set up as OneCoin Limited, who Ruja Ingnatova’s mother, Veska Ignatov, laundered money through via Pegaron Invest Limited, a Bulgarian company. OneCoin’s virtual office address was formerly provided by AMS Company Management Limited. On February 2nd, 2016, AMS Company Management Limited issued a statement declaring OneCoin “does not have authority” to use their mailing address. OneCoin appear to have been unable to work things out with AMS Company Management, or find virtual office provider that would register them. Why AMS Company Management Limited gave OneCoin the boot is unclear. On the 26th of August, Veska Ignatov filed an application to strike OneCoin Limited off the Gibraltar companies registrar. Ignatov provides no reason for the request in the filing. Since striking OneCoin off the Gibraltar companies registrar, the OneCoin website has been absent corporation information. Any mention of Gibraltar has been scrubbed. The OneLife website currently provides a corporate address in Belize for OneLife Network LTD.
Research reveals this address belongs to Ally Professional Services LTD. Whether Ally Professional Services Limited are aware they are providing offshore incorporation services to a global Ponzi scheme is unclear. Both Gibraltar and Belize are known tax-havens with little to no regulation. oz: Since striking OneCoin off the Gibraltar companies registrar, the OneCoin website has been absent corporation information. Any mention of Gibraltar has been scrubbed. if onecoin, which calls itself a ‘company’ on it’s website, is not incorporated or registered anywhere in the world, what does this mean in the legal sense? does it mean onecoin is an illegal entity everywhere in the world? ravenrcapital was incorporated in may, 2016 and is headed by Gary Michael Gilford who is a solicitor by occupation. so who is Tsvetelina Lekova and what is her connection to ravenr.com. 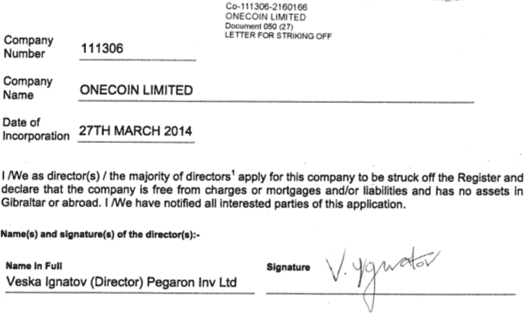 maybe gilford should be asked where onecoin ltd is registered? Another connection throughout all these companies is the supplied contact email – office(at)ravenr(dot)com. Surely this scam cannot continue for much longer! Over the last few months I have contacted a number of “top leaders” in different countries, offering to sell them my 1800 coins that I hold. I’m sure you won’t be at all surprised when I tell you that not one of them was interested in purchasing them even at a massively reduced amount (compared to what one coin have set the price of them at). And I’m sure you will be even less surprised when I tell you that two of the leaders I contacted were our old friends, and professional ponzi pimps, Joby Boughy and Ken labine. This surely is proof enough that they know the coins are totally worthless. Is there any evidence that money was laundered through bank accounts associated with the Gibraltar company or is this an educated guess/assumption? Gibraltar has at least 3 regulators for money laundering (GFIU, GFSC, GCID) who I imagine would be very interested to receive any evidence you have collected regarding Ignatova’s illegal financial activity. Gibraltar is heavily regulated (examples given above), and one of the initial signatories to both of the international govt. financial spying ops FACTA and CRS. Gibraltar is not on the FATF List of Countries that have been identified as having strategic AML deficiencies. Gibraltar is part of the EU and a British overseas territory, it’s not some tin pot banana republic that turns a blind eye to obvious scams like OneCoin. That’s possibly why they’ve now been axed by AMS. Oz you’re doing great work here but it seems that you sometimes let your personal bias slip into your reporting. Emotional accusations and assumptions in the comments is one thing, and kind of fun to read, but in the main articles it risks devaluing your contribution, IMHO. They will be scamming darts and arrows from African tribes soon. A legit company would be domiciled somewhere. Onecoin itself doesn’t need to be domiciled, because it doesn’t use it’s actual name for anything important though. We only see some of the shell companies they use through their public banking. Who knows how deep the rabbit hole goes on the corporate backend. All these little islands in the middle of nowhere are tax-havens. Why would any legitimate business incorporate there otherwise? Sure, the law might catch up to scammers operating in places like Gibraltar eventually, but let’s not pretend a jurisdiction of 30,000 residents has any serious regulation. One Network Services Limited: (removed)@ravenr.com. imgur.com/a/IRuBi. Another scam site in the portfolio is cryptoreal.com. Claims to be an investment trust run by OneCoin. Check out the news of their acquisition of a natural gas and coal field in southern Madagascar partially funded with OneCoin in late August. Allinson resigned as Director on 10th October. However, she remains the sole shareholder in the company. A search on Allinson reveals she had a short stint as Director of UK company International Marketing Services between 6th April and 12th May. A current Director of this company is one Frank Ricketts, 64. OzDelphi: Getting more interesting, no? so onecoin has deep ties with a UK based company. this should make things easier for the london police! OzDelphi: A search on Allinson reveals she had a short stint as Director of UK company International Marketing Services between 6th April and 12th May. A current Director of this company is one Frank Ricketts, 64. Just to group relevant stuff together, from Nickolay Stoyanov. “Another connection throughout all these companies is the supplied contact email – office(at)ravenr(dot)com. “Ravenr is an independent single-family office that focuses on wealth accumulation and long-term capital appreciation through investments in high quality businesses from around the globe. what made ruja ignatova shift her base shell company ravenr from dubai to the UK? dubai would have been a safer jurisdiction for all her hanky panky! was there trouble in dubai, or did frank rickets make her shift the registration of ravenr for some selfish interests? back in may 2016, these scummy scammers may not have foreseen a police investigation in the UK. the london police should haul in ravenr and check all the money flowing through this company! Companies are never registered in Dubai, in Dubai you have to share 51% with a local sponsor, no one right in his mind would do that if the business is not taking place in Dubai and need help from locals to develop. They are registered in Ras Al Khaimah and rent a virtual mail box in Dubai to make stupid peoples think that they are registered in Dubai. I met Gary Gilford in July last year and he was telling me about his new job, and how Ruja had just promoted him to Director. He told me she was bizarre, going out at lunch to buy diamonds in Bond Street and that her whole life was staged and filmed as a PR event. He seemed to believe 100% in what she and OneCoin were selling, but it all sounded absolute rubbish to me, and this was the first time I’d heard of OneCoin, so I don’t believe there’s any doubt he was fully aware and complicit in the fraudulent nature of the business. @Labinated, thanks for the info. Apologies to both of you for my slow acknowledgement.